If you have decided to run your project in agile mode, this page will describe how to get started. Scrum is used as the conventional name when describing agile within Hansoft. Sprints ("iterations" in eXtreme Programming) with specific sprint members, users and burndown charts. Special customizable agile columns such as category, complexity points, confidence, estimated ideal days, priority, release tag, risk and user tag. In agile projects, you either work directly in the schedule view, on a board, or in a prioritized view. 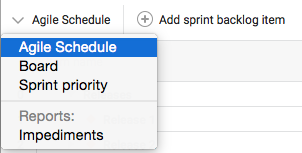 The schedule view offers the full, complete schedule for the project, with all sprints, releases and items, while the Board and sprint priority views are specialized planning tools commonly used in agile planning. An agile project often starts either by doing sprint planning, or by constructing a product backlog from which user stories are committed to sprints. A sprint has been added for the prototype phase of an e-mail application, and items have been committed from the product backlog. A burndown chart can also be seen. In this screenshot, we have started our agile project by constructing a main product backlog. We have created backlog items (for example requirements, enhancements, bugs etc.) and later prioritized them in items sorted. Some of the items have been committed to a sprint.